Conventional wisdom considers deserts stark, harsh regions that support few living things. Most people also believe that water alone makes the desert bloom. 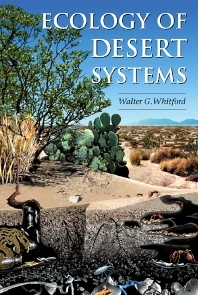 Ecology of Desert Systems challenges these conventional views. This volume explores a broad range of topics of interest to ecosystem, population, community, and physiological ecologists. Climate, weather patterns, geomorphology, and wind and water processes are examined as variables that affect the distribution of biota through fundamental ecosystem processes. Descriptions of morphological, behavioral, and physiological adaptations of desert biota illuminate, through the lens of patch dynamics, principles for understanding observed patterns of primary production, nutrient cycling, and the effects of consumers. Desertification, and the techniques for monitoring and quantifying it, is examined within the framework of desert ecosystem patterns and processes. Undergraduate and graduate students, professionals, and scientists in environmental and natural resource management. Conceptual Framework and Paradigms. Landforms, Geomorphology, and Vegetation. Characterization of Desert Climates. Wind and Water Processes. PatchMosaic Dynamics. Adaptations. Primary Production. Consumers, Consumption, and Secondary Production. Decomposition and Nutrient Cycling. Desertification. Monitoring and Assessment. Desert Ecosystems in the Future. Professor Walter G. Whitford received his PhD from the University of Rhode Island in Physiolgical-Ecology. He spent the next fifty years working in the Chihuahuan Desert as a faculty member in Biology at New Mexico State University (NMSU) where he was principal investigator in the Desert Biome Program which was part of the International Biological Program. His research focused on field experiments and studies of termites and seed harvesting ants. That program stimulated his commitment to the importance of soil in arid ecosystems and the organisms that are involved in nutrient cycling. He also served as the first principal investigator for the Jornada Long Term Ecological Research Program. As principal investigator, he published more than 150 papers in peer reviewed journals dealing with most aspects of desert ecology. In 1993, he left the university to work as a senior research ecologist with the U. S. Environmental Protection Agency with a focus on monitoring and assessing the health of arid ecosystems. After retiring from the EPA he produced the first edition of Ecology of Desert Systems and continued to teach and do research in the Chihuahuan Desert. While a professor, he did research in Israel and Australia, evaluated arid lands research programs in South Africa, and organized a symposium on the Atacama and long-term ecological research in Chile. Before embarking on the 2nd edition of Ecology of Desert Systems, he was author or co-author of more than 300 peer-reviewed publications.